Recent research has revealed that, without vitamin K2, calcium regulation is disrupted. In fact, low levels of vitamin K2 are associated with an increased risk of heart disease and atherosclerosis.1 Astute doctors have long known that people with a lack of calcium in their bones are more likely to possess an excess of calcium in their arteries, and vice versa. Osteoporosis and heart disease—they seem as unconnected as two conditions can possibly be. On the surface, they do share a few common features. Both conditions develop with age. It’s rare for someone to have either condition at age 30, but both are common in the sixth or seventh decade of life. Both conditions don’t develop overnight but require many years to emerge. Just as osteoporosis requires decades to develop, coronary atherosclerosis also accumulates bit by bit over decades, starting in a person’s 20s (or earlier) and building gradually until a heart attack or other catastrophe occurs. But the resemblance appears to stop there—that is until we dig beneath the surface. As long ago as the 19th century, scientists knew that an unknown material lining diseased arteries resembled a bone-like structure. For the next 100 years, however, this finding was dismissed as a curiosity, an inevitable accompaniment of aging, and evidence of “wear and tear,” just like arthritis. Another curious observation increased the momentum to find a link between bone and arterial diseases. People who had osteoporosis, or a lack of calcium in their bones, were more likely to possess an excess of calcium (bone) in arteries and vice versa. In fact, what had often been simply assumed to be calcium deposits or calcified plaque was actually fully formed bone tissue. Vascular calcification should, therefore, be more properly designated as vascular ossification—bone formation within blood vessels. Likewise, many “risk factors” for coronary atherosclerosis were also prevalent in osteoporosis: aging, diabetes, sedentary lifestyle, smoking, and high cholesterol. Scientists questioned why there was such a tight link between excess calcium in one organ (bones) and deficient calcium in another (arteries). And why, in some apparently healthy people, are the two present simultaneously to such extremes? Vitamin K is required by the human liver to manufacture blood-clotting proteins (factors II, VII, IX, X; and proteins S and C). This is the basis for administering the vitamin K-blocking drug, warfarin (Coumadin®) to people who have blood clots or are at risk for blood clot formation since clot formation is effectively suppressed by the drug. Since it was first discovered in 1929, vitamin K has best been known for its crucial role in the blood-clotting process. Since that time, scientists have uncovered compelling evidence that vitamin K plays an equally important role in bone health. 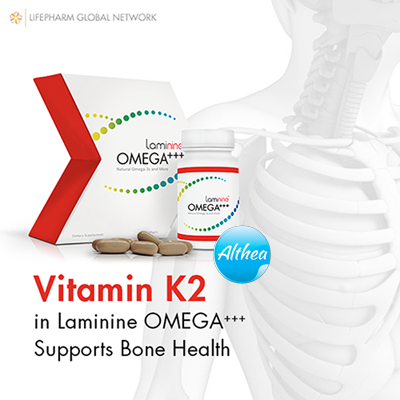 The Japanese long ago recognized the power of vitamin K2 to maintain or restore bone health. In certain regions of Japan, a staple dish called natto or fermented soybean, frequently eaten several times a week, is uniquely rich in vitamin K2. The Recent scientific examination has pinpointed vitamin K2, and in particular vitamin K2 as menaquinone-7 (MK-7), as the active ingredient in this popular eastern Japanese dish, as having a supportive effect on bone quality during osteoporosis treatment. People living in the Japanese regions where this dish is eaten have several-fold greater blood levels of vitamin K2 (MK-7), accompanied by less osteoporosis and bone fractures. These findings are supported by clinical trials, in which vitamin K2 has been shown to successfully reduce the incidence of bone fractures. A two-year Japanese study found that vitamin K2 (MK-4) reduced the incidence of vertebral (spine) fractures by 52% in 120 patients with osteoporosis, compared with patients who did not receive this nutrient. The high dose used in this trial—as with most studies examining vitamin K2’s effect on bone density—was 45 mg/day, a prescription dose used in Japan to treat osteoporosis that is unavailable in the US. As you will read later, lower doses of K2 found in dietary supplements appear to also provide significant benefits. Fit and trim at age 67, Walter had no reason to believe that he had any hidden health conditions. He’d had annual physicals for the past seven years, passing them all. According to his doctor, his cholesterol numbers had been fine for years. However, Walter’s brother-in-law, a physician whose own brush with heart disease prompted him to warn everyone else in the family about the possibility, suggested that he undergo a computed tomography heart scan. Walter’s heart scan score was 3,367, a high score that signaled a dangerous content of calcified atherosclerotic plaque in his coronary arteries linked to a high risk for heart attack. In fact, Walter’s score put him in the 99th percentile, meaning that his calcium score was in the worst 1% of all men in his age group (and carried an annual risk for heart attack of 25% without preventive efforts). At about the same time, Walter enrolled for a screening service that came to his church offering ultrasound screening for an abdominal aneurysm, carotid disease, and osteoporosis. While Walter proved to have no aneurysm or carotid issues, he did show the bone density of someone 20 years older, revealing an advanced state of osteoporosis. Experimental animal models of osteoporosis have also revealed that MK-4 improves bone architecture, increases bone mass and mechanical strength, stimulates mineralization (deposition of calcium), and enhances collagen architecture—a crosslinking of fibrous tissue that yields tough but supple bone that is more resistant to fracture. On the other hand, osteoporosis—the excessive loss of bone mineral density—results in fractures and leads to devastating events common in those over 65 years, even with minor injuries like a fall. Unfortunately, the drug industry focuses on prescribing drugs late in life when the risk of fracture is high. Strategies that involve nutritional supplements are different. Firstly, they lack the high cost and side effects of prescription drugs. Secondly, they can potentially be started at an earlier age and taken over 20, 30, or more years in order to yield possibly greater benefit than drug therapy started at the age of 60 to bail out a process that has developed over decades. Although there are no clinical trials for such an extended period, this is an area worthy of future investigation. However, calcium has historically been viewed as a passive marker, certainly not an active participant in heart disease. Some maintained that calcium was nothing more than a remnant of prior “rupture,” a scar from the dangerous inflammatory activity of soft plaque. They even argued that calcium was, in fact, a reflection of increased plaque stability, as the “hard” material was not itself prone to rupture. Thus, they believed that calcium played no active role in contributing to atherosclerotic plaque. Those arguments have now been dashed by new observations. A definitive connection between vitamin K2 levels and heart disease, in terms of a large-scale, well-controlled clinical trial, was first described in 2004 in the Rotterdam Heart Study—a Dutch trial that tracked 4,800 participants for seven years. The study revealed that participants who ingested the greatest quantities of vitamin K2 in their diet experienced a 57% reduction in death from heart disease than people who ingested the least. The same relationship did not hold for vitamin K1. Unfortunately, in this study, MK-4 and MK-7 intake and levels were not separately analyzed but were grouped together, along with other MK categories such as MK-8 and MK-9. Physicians and scientists are now intensely interested in monitoring and halting the accumulation of coronary calcium since they know that it comprises a significant portion of atherosclerotic plaque volume. The menaquinones make up about 10% of vitamin K consumption and can also be synthesized in the gut by healthy microflora. There are several different forms of menaquinone. Menaquinones are short-listed using the notation MK-n, where the ‘n’ specifies the number of prenyl side chains. MK-4 is available in high doses by prescription. MK-8 and MK-9 are found in fermented food products like cheese. Soy natto is a rich source of the highly bioavailable form of K2 known as MK-7. MK-4, also known as menatetrenone, is distinct from other menaquinones because it is not a major constituent of MK-n produced by gut microflora. The exciting preliminary evidence is emerging that vitamin K2 may suppress cancer. Similarly, a pilot study in 61 people recovering from the surgical removal of hepatocellular carcinoma (liver cancer) showed that 45 mg/day of MK-4 (the dose used in Japan to treat osteoporosis) enhanced cancer-free survival by a wide margin. In the laboratory, vitamin K2 demonstrates inhibitory effects against myeloma and lymphoma, suggesting possible applications for individuals fighting these hematologic cancers. Where do we get Vitamin K2? Vitamin K1 occurs naturally in green leafy vegetables, whereas vitamin K2 is found in relatively few foods. Organ meats, egg yolks, and the Japanese condiment Natto are sources of vitamin K2, of which natto is by far the richest source. Unfortunately, natto is an acquired taste and a dish that the average American may be unwilling to try. Vitamin K2 is also found in modest quantities in traditionally fermented cheeses, in particular, Swiss Emmental and Norwegian Jarlsberg.18 Of total vitamin K dietary intake, only about 10% is the K2 form. Vitamin K deficiency can also result from impaired absorption, in addition to not getting enough in the diet. It can also be caused by prolonged use of antibiotics since bacteria that normally reside in the colon (and are obliterated by antibiotic use) is responsible for producing approximately half of the vitamin K needed every day. Unfortunately, the present recommended dietary intake of vitamin K, 90 mcg/day for women and 120 mg/day for men, may be inadequate to maintain optimal heart and bone health. Although vitamin K1 is rapidly cleared from the blood, K2 lingers in the blood for an extended period when taken orally and can rise to much greater levels than seen with K1. Vitamin K2 appears to be safe, with no side effects identified even at high doses. In Japan, K2 substantially improves bone density and prevents osteoporotic fractures, given either as a high-dose prescription agent (45 mg/day) or in the Japanese dish natto. Together, these findings suggest that vitamin K2 may be the preferred form of vitamin K for supplemental use. Osteocalcin is a calcium-regulating protein that is controlled by vitamin K2. When vitamin K is present, osteocalcin normally undergoes a process called carboxylation, which binds osteocalcin to the mineral portion of the bone. However, in vitamin K2 deficiency, osteocalcin cannot perform this function, resulting in unrestrained calcium resorption (removal) of bone tissue that leads to osteoporosis. The opposite situation seems to occur in the arteries. Calcium is deposited because another protein called matrix GLA-protein, which is a calcification inhibitor and is also K2-controlled, cannot undergo the process of carboxylation in a vitamin K-deficient state. Because only carboxylated matrix GLA-protein inhibits calcification, undercarboxylated matrix GLA-protein has been found to occur in unusually high concentration at the edge of calcified and atherosclerotic plaques, suggesting it plays an active role in depositing calcium in plaque.4 Impairment of the function of osteocalcin and matrix GLA-protein due to incomplete carboxylation results in an increased risk of developing osteoporosis and vascular calcification, respectively.